David Eades: Some pretty urgent message coming from Premier Wen Jiabao's remarks calling for political reform. How urgent is this? 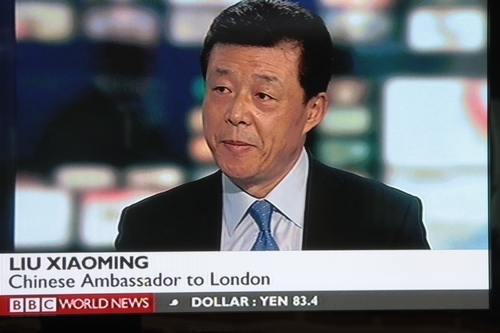 Ambassador Liu Xiaoming: I think what Premier Wen said reaffirmed Chinese government's commitment to political reform. In fact political reform is an ongoing programme. Its really a part of China's overall reform and opening-up. When Deng Xiaoping set the agenda for reform and opening-up, political reform is always part and parcel of this programme. David Eades: Are we talking here about what we might call people power reforms, giving more power to the people, because I think Wen Jiabao was not specific about what these reforms would be. 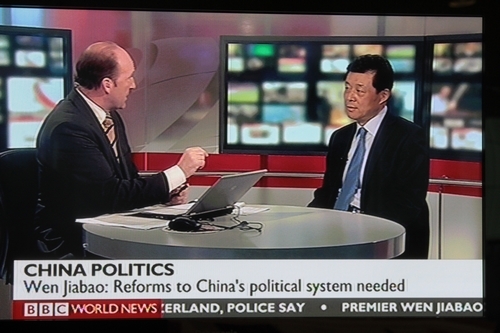 Ambassador Liu Xiaoming: In fact political reform back in China is very specific. Like in the past 30 years, we abolished the life-time tenure for the leadership. Before we started the programme, many Chinese leaders served a very long term. Now, there is orderly and smooth transition from previous leadership to the new leadership through the election by the People's Congress. That is the Chinese way of democracy. David Eades: Right. But we got this reference of urgency here and a well-known saying that a journey of a thousand miles starts with the first step. There are a lot of steps to take here, not least the concern among many Chinese people about corruption within Party ranks as well as government ranks. When is that going to be something you can put your hand up and say "We have dealt with that." Ambassador Liu Xiaoming: I would say, number one, political reform is always part of reform and opening-up. Secondly, China has achieved enormous progress in political reform, if you compare China today, politically, with China 30 or 60 years ago. David Eades: But is it quick enough? A lot of people say it is not quick enough. Ambassador Liu Xioaming: And thirdly I would say, there is still a big room to improve. No system is perfect. We admit that there is still a long way for China to go in terms of how to make the government more accountable, how to respond to the people's desire for broader participation in political decision-making. I think the steps have been taken. It will speed up in the days to come. David Eades: I just want to ask you also as you are here about the situation in Syria. I want to ask you this: What does it take from the Syrian authority, from the Syrian government to do for China to finally condemn President Assad's action, and perhaps to move closer in line with some of the Western nations who are ready to move in the way that you are not? Ambassador Liu Xiaoming: We condemn violence from any side. China does not protect any side. China does not condone any violence. We are very concerned about loss of lives, especially loss of lives of innocent people. We are calling for violence to be stopped and dialogue to be started. We support UN good offices. We support Kofi Annan's diplomatic efforts. We believe that the United Nations should take leadership. But we are opposed to any military intervention or regime change. We believe we should show respect for sovereignty, independence of the Syrian people. David Eades: Very briefly. Does that mean you want the regime to stay? Ambassador Liu Xiaoming: I think it is up to the Syrian people to choose their leadership. It is not for outside world to impose their way, whether their leaders should stay, or not stay. It is up to the Syrian people. David Eades: But the political result is continued fighting. That is the trouble. Ambassador Liu Xiaoming: I think with the united efforts by the United Nations, by the international community-we have sent our envoys to Syria to talk to the Syrian leadership, and also their opposition people, I think with the concerted efforts of international community, things will improve. That is our hope. We will continue to work along this line.